Goals from Shane Long and Dusan Tadic earned Southampton only their second league win in nine games as they saw off Watford at St Mary's Stadium. 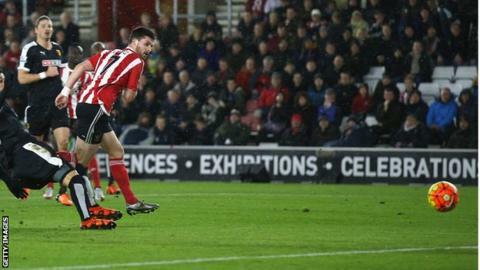 The Saints were exceptional and outshone their in-form visitors on a wet and cold night on the south coast. Long opened the scoring when he directed his header past Heurelho Gomes from a excellent Matt Targett delivery. Dusan Tadic made it 2-0, two minutes after coming on in the 71st minute, when he fired in from eight yards. The Saints move up from 13th to 12th with the win, two points behind Watford who remain on 29 points, but drop from ninth to 10th. Saints manager Ronald Koeman had seen his side play well in patches over the past few games, but bar the 4-0 win over Arsenal on Boxing Day, they have lacked the killer punch in the final third. On a night for only the hardiest souls, the Dutchman's players showed their mettle and made it count in the final third, while Watford never looked up for the battle. Long and Tadic might have grabbed the goals but it should be Sadio Mane who grabs the headlines. The Senegal midfielder, who was left out of the starting XI for the 1-0 loss to Norwich as punishment for arriving late, started and ran the visiting backline ragged with his pace and tenacity. He had two great chances to score - first a low shot that whistled past the post when he just had Heurelho Gomes to beat, and then a drive that narrowly missed the upright. What happened to Ighalo and Deeney? The Watford strike force of Odion Ighalo and Troy Deeney, who have scored 20 goals between them this season, only managed one shot each and neither was on target. Their supply line was cut off thanks to the dogged work of the Saints midfielders, who suffocated the space for Almen Abdi, Etienne Capoue and Ben Watson. The Hornets' only shot on target came in the 85th minute when substitute Craig Cathcart drove in a skidding effort that Fraser Forster easily collected down to his left. The England goalkeeper was making his first start since March after recovering from a knee injury. He could not have hoped for an easier reintroduction. "We had really big chances, Sadio had two big chances. The team was aggressive and superb. "The centre-backs did a great job, with Matt Targett on the left and Cedric Soares on the right. There was also good movement from midfielder Steven Davis - he was one of the best of the night. Watford only had one good chance. "It makes everybody proud that Fraser [Forster] is back. A clean-sheet gives everybody a good boost." "We didn't hit the level of other matches. We didn't play well. It was the worst match we've played in the Premier League. Southampton played much better. "I am sorry for the first half. I apologise to the fans. It's the first time in the season we failed to find the level. "We didn't play our style on the pitch. The players can make mistakes - it's football." The Saints will be looking to make it two wins out of two on Saturday when they host West Brom. The Hornets are away to Swansea. Match ends, Southampton 2, Watford 0. Second Half ends, Southampton 2, Watford 0. Corner, Southampton. Conceded by Craig Cathcart. Offside, Southampton. Dusan Tadic tries a through ball, but Shane Long is caught offside. Corner, Southampton. Conceded by Sebastian Prödl. Hand ball by Víctor Ibarbo (Watford). Corner, Southampton. Conceded by José Holebas. Attempt missed. Dusan Tadic (Southampton) left footed shot from the left side of the box is high and wide to the right. Foul by Jordy Clasie (Southampton). Attempt saved. Craig Cathcart (Watford) right footed shot from outside the box is saved in the bottom right corner. Substitution, Southampton. Maya Yoshida replaces Cédric Soares. Substitution, Southampton. Graziano Pellè replaces Steven Davis. Attempt blocked. Troy Deeney (Watford) right footed shot from outside the box is blocked. Assisted by Ben Watson. Goal! Southampton 2, Watford 0. Dusan Tadic (Southampton) left footed shot from the centre of the box to the centre of the goal. Assisted by Steven Davis with a headed pass. Substitution, Watford. Craig Cathcart replaces Miguel Britos. Odion Ighalo (Watford) wins a free kick in the attacking half. Substitution, Southampton. Dusan Tadic replaces Sadio Mané. Attempt missed. Sadio Mané (Southampton) right footed shot from the centre of the box is close, but misses to the right. Assisted by Shane Long. Attempt missed. Sadio Mané (Southampton) left footed shot from the left side of the six yard box is close, but misses to the left. Assisted by Virgil van Dijk following a set piece situation. Substitution, Watford. Víctor Ibarbo replaces Nyom. Attempt saved. Oriol Romeu (Southampton) left footed shot from outside the box is saved in the bottom left corner. Assisted by Shane Long. Offside, Southampton. Oriol Romeu tries a through ball, but Steven Davis is caught offside. Ben Watson (Watford) wins a free kick in the attacking half. Substitution, Watford. Ikechi Anya replaces Almen Abdi. Jose Fonte (Southampton) wins a free kick in the defensive half.